It's safe to drink the water in Athens now (per this announcement). We may hear news by Tuesday on whether this advisory gets lifted after repairs to the water main on Jefferson Road were completed. 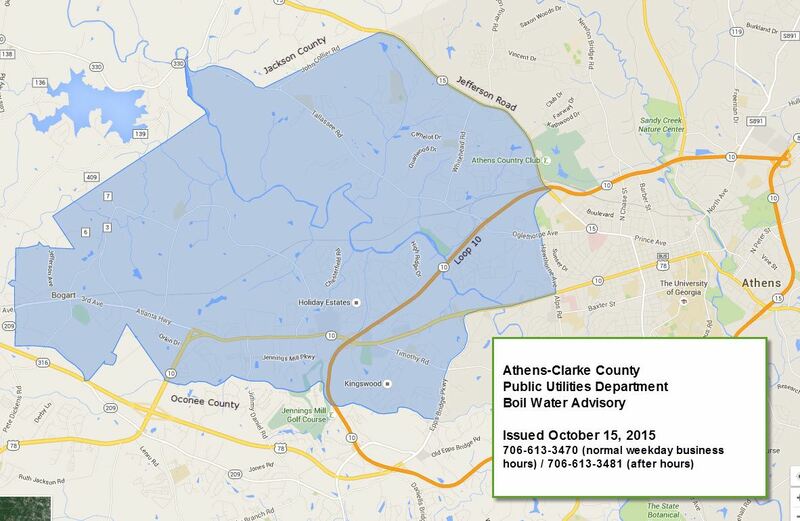 In order to protect the public from a potential health hazard, all Athens-Clarke County residents located in the affected area are advised to boil all water prior to use for drinking, cooking, or preparing baby food. The affected area covers the area bounded by Jefferson Road / Hawthorne Avenue / Atlanta Highway / Epps Bridge Parkway to the east and the Oconee County and Jackson County county lines to the west. It also includes Bogart residents who are Athens-Clarke County Public Utilities customers. A map of the area is linked to this release or view the map.